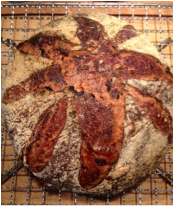 Artisan & Sourdough Bread - Saving the world from bad baking. Saving the world from bad baking. Flour, Water, Salt & Yeast is all you need! Eat your way to better health with delicious, warm, home-baked artisan and sourdough bread! It's easier to make than you think and it tastes great and, to make it, all you need is flour, water, salt and yeast! In this mix of demonstration class and hands on workshop, you’ll see how easy it is to mix and knead your bread for optimal flavour development, learn about resting, knocking back and proofing as well as shaping and baking. You’ll also get to eat some freshly baked bread, along with cheese, cold meats, jams and tea for lunch. Find out the secret to making your home-baked bread look and taste as good, if not better, than a loaf from the bakery, and you might never want to buy bread again not once you find out how satisfying and delicious it is to bake your own! If you already know the basics, join us for a course on preferments!